our universe expands into a larger manifestation. In the classic expression of the Tarot we find the image of the Goddess dancing amidst the stars. A Skyclad Woman suspended in a field of stars, dances with a veil facing away from us. Like all the cards, this refers to our perception of the universe rather than the Universe itself. Once we perceive beyond the veil of reality we can begin to understand the mechanics of what it is we see. The letter associated with this card is Tau: the World: terra firma, the Material World. On first examination we think that we are seeing limitless space, however that is but an illusion. Ruled by Saturn, a symbol of limitation, this card represents all that we know: information, knowledge, and hearsay; limited by the constraints of time and space and our ability to understand what we perceive. So often when we look out at the universe we find our own image looking back, reflections of ourselves in nature, random patterns in the clouds and stars. Each time we learn something our universe expands into a larger manifestation. Central to the expression of The Universe is the Dance. In the classic expression of the Tarot we find the image of the Goddess dancing amidst the stars. Gaia represents the embodiment of all life on Earth as a single form of consciousness dancing the ever-evolving modes of being. Her art is Life itself, her pallet are the millions of forms of life across the land and sea. Within the Tarot this image is expressed with a human form because of our tendency to perceive our world around us by what it is we already know. Rhythm is of Gaia; each beat is a heartbeat, a turn of the tide or the change of the seasons. Music of all kinds is associated with The Universe Card: Rhythm, tone, song, symphony. Rhythm’s manifestation permeates all things, including ourselves. Seeing the dance of creation is one thing, to participate is quite another. To make music is to participate in Gaia’s expression; Dancing is embodying her movements, her gestures. To make the structured movements and sounds of our own written and choreographed art is to participate in the rhythms of the seasons and tides. To improvise is to participate with her Dance of Creation. 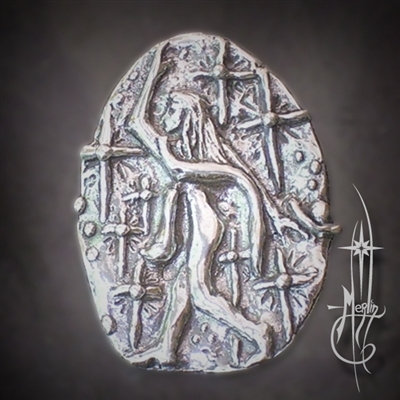 The Universe Amulet presents a moderately veiled Gaia, immersed in stars and planets. The letter Tau is set in the middle of the amulet, representing “the World”: the material world covering her like a veil. There is always a part of Her that is obscured: the Unknown. As our experience of the world around us expands, so too does our awareness of it. The more we perceive the more we understand our limitation of perception. The pendant is in the shape of the Fool Amulet: an Egg; distorted by our ever expanding awareness of what is beyond, budging where we find physical limitations. The Universe Amulet is for those that are explorers, scholars, students, those who have taken on the quest of Life: ever searching for meaning, the source, and themselves. The Universe Amulet is for musicians, dancers, lovers of music and the arts; those that push the envelope and are unafraid of new experiences, new ideas and a larger Universe.